Free World Order: IS PAUL MCCARTNEY DEAD? Or at least that's what a conspiracy theory popular among Beatles and music fans in general says. Now, with the 50th annyversary of the publication of the Beatles first record I thought it would be nice to make an article about it. With the annyversary, McCartney, who is already filthy rich, will become even richer, or at least the impostor who occupies his place will. This theory is quite confusing and there are different versions of it. According to the main theory, on November 9th, 1966, Paul McCartney walked out of a studio where he and the rest of The Beatles were recording for Sgt. Peppers album. He just had an argument with John Lennon. He stepped into his car and he drove away. His friends would never see him alive again. When the authorities realized that the man in the car was McCartney they took swift measures. They got John, Ringo and George and they showed them Paul's body. In the accident, he lost his head and the head itself was missing an eye. Once they were at the morgue and they recognized Paul's body, they were told by the secret services not to tell anything about Paul's dead. The British government did not want to lose the export revenues from The Beatles's records. They were scared about social unrest and they were pressured by their Illuminati masters who didn't want to lose The Beatles as a platform to spread their Luciferian ideas among the youth. The idea was to replace McCartney by an impostor. Some go even further, and they propose that all The Beatles were murdered and replaced by doubles. The chosen man for the job was William Campbell aka Billy Shears, the winner of a Paul McCartney lookalike contest. The other three Beatles were threatened with death if they said something. 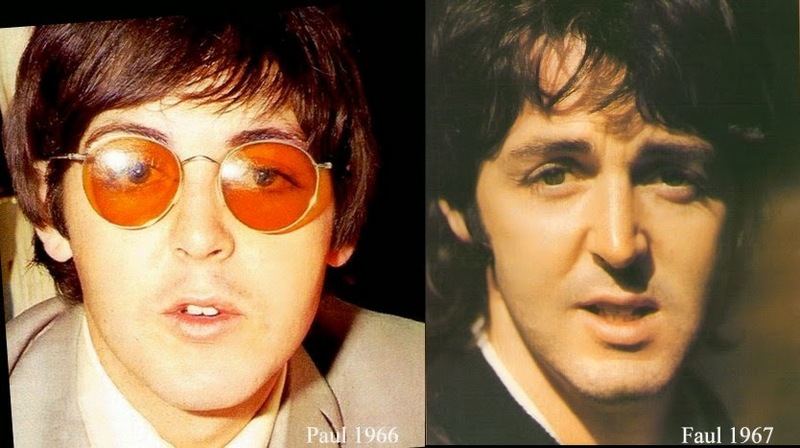 To make Shears look more like McCartney he was subjected to different rounds of plastic surgery. The Three remaining real Beatles called him Faul, false or fake Paul. On the left you can see the real Paul McCartney. On the right, Faul. 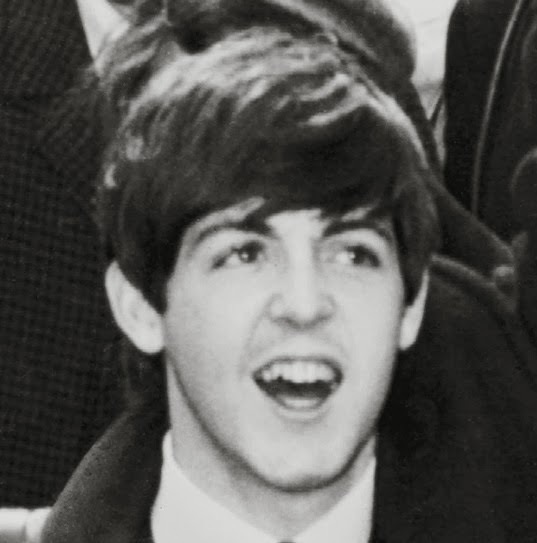 You can see that Faul has a longer face, a longer nose, and his mouth is larger. You can also see that his eyes aren't so round as Paul's. This photo is of 1967. Nowadays Faul looks more like Paul, after being subjected to many operations of plastic surgery. Ringo, George and John were threatened with death if they would ever tell anything about Paul's death. But in spite of that, they left many clues in their albums, that's how the story ended leaking out. 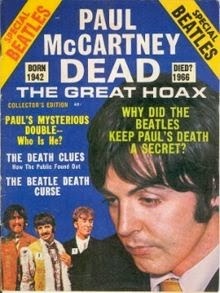 The story came out in September of 1969, when the newspaper of the University of Drake published an article called "Is Beatle Paul McCartney dead?". One of the clues that the article described was that when the song Revolution 9 of the album White Album is played backwards you can hear "turn me on dead man". They are many other clues left in songs being played backwards. When you play a vinyl record backwards you damage it much quicker than if you play it forwards. That's why some people suggested that the all affair was a conspiracy of the record industry to sell more albums. In October, the rumor continued to spread after a guy called Tom told radio-station WKNR-FM about the conspiracy and its clues. Around a week later a disc jockey named Roby Yonge talked about the PID conspiracy at WABC radio, a station heard in most of the US and even other countries. After an hour he was mysteriously pulled off the air. Was he telling something they did not want him to tell? 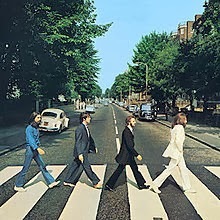 One of the most famous clues is the cover of the album Abbey Road, where you can see The Beatles walking in a funeral procession. Lennon dressed in the white like a preacher or an angel. Ringo dressed in black because he's mourning for Paul. Harrison dressed in blue like a worker representing a grave-digger. And Faul walks barefoot because he's dead, so he no longer needs shoes. 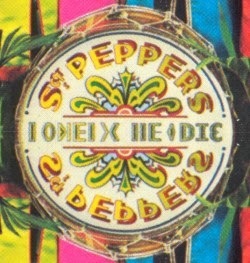 Another legendary clue is the drum that appears on the cover of the Sargent Peppers album. If you put it against a mirror you'll read 1 1 9 he die (November 9th he died). Also some speculate that John Lennon was murdered in 1980 by the FBI or the CIA because he was planning to tell the truth about Paul's death. Even Lennon's son thinks this. It's also believed that Yoko Ono was an MI6 agent. Curiously, around twenty years later somebody tried to kill George Harrison. OK, that's all for now. I'll be back soon with another fascinating conspiracy. See you later alligator!